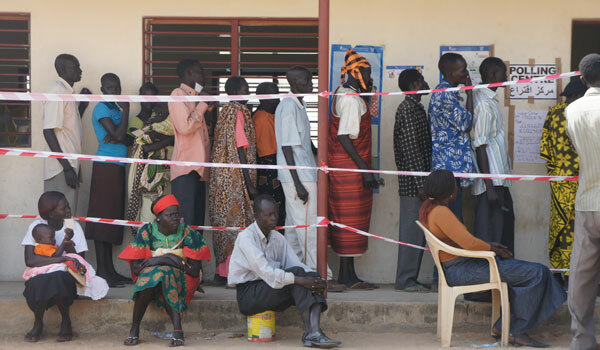 Southern Sudanese stood in line for hours at polling stations across Southern Sudan. In stark contrast to the atmosphere in the South, Northern Sudan polling stations often stood empty. Only 60 percent of eligible voters in the North went to the polls, whereas 99 percent voted in the South. 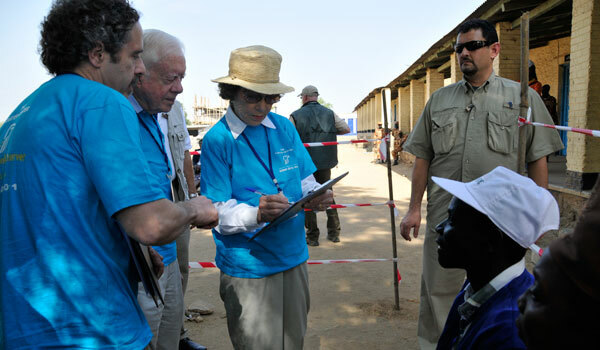 David Carroll (left), director of the Carter Center's Democracy Program, former U.S. President Jimmy Carter, and former First Lady Rosalynn Carter consult with staff at a Southern Sudan polling station as they observe voting. 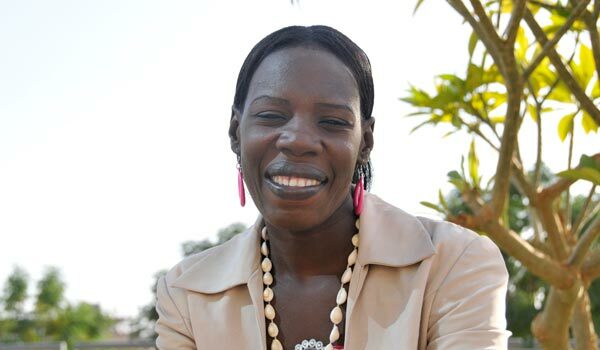 "I am Sudanese, my origins are from the South, my parents are from the South - but I've lived here in Khartoum for most of my life," said Joyce Khamis, 29. "I didn't vote because I believe in unity. Whether there is secession or unity, we remain brothers and sisters." 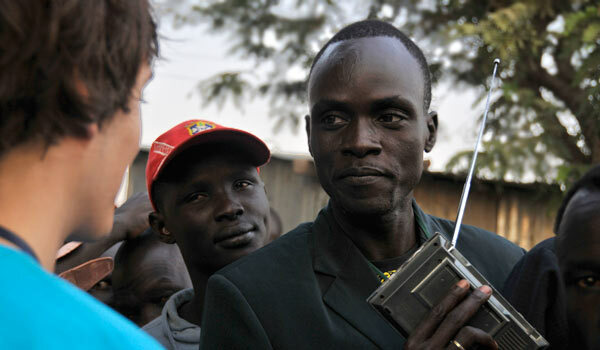 Juba resident Ibrahim, 33, talks with Carter Center observer Paul Linnell on Jan 9, 2011. As the sun rose across Juba on Jan. 9, Lulogo Market area resident Ibrahim, 33, had already waited in line for hours to be among the first to vote in Southern Sudan's historic referendum on self-determination. He clutched a small radio with antenna pointed toward the sky to hear news fragments from BBC and local stations about the referendum. Around him, hundreds of others also queued, some holding mattress pads – they had spent the night on the ground in front of the station – as poll workers unpacked materials, taped up signs, and sealed the empty ballot boxes. "I've been anticipating this vote for a long time," said Ibrahim. "Every day I would check to be sure I still had my voter registration card, it's a very important day." More than 100 Carter Center observers witnessed the birth of what will be the world's newest nation, following Jan. 9-15 voting, with an overwhelming majority of 98.8 percent voting for secession from Sudan. The new nation likely will be called South Sudan. Former U.S. President Jimmy Carter, former U.N. Secretary General Kofi Annan, former Tanzania Prime Minister Joseph Warioba, and Dr. John Hardman, Carter Center president and CEO, led the Carter Center's international delegation. 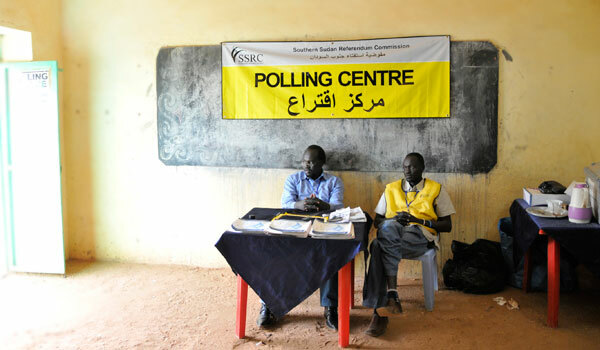 The Center's observers were deployed across Sudan and overseas voting locations to assess the referendum process and monitor polling, counting, and tabulation. "The entire exercise was orderly, pleasant, and productive, and it is expected that The Carter Center will remain involved in both Sudan and South Sudan to promote peace, democracy, and better health and education," said President Carter. In its Jan. 17 preliminary report, The Carter Center concluded that despite challenges the referendum process was generally credible and marked by an overwhelming turnout of enthusiastic voters. At many polling stations in the South, especially on the first day, voters would cheer or sing as they left the polls and those in line would join in. The scenes were often very different in the North though, where some southerners felt intimidated to or did not want to vote, for various reasons. Hundreds of thousands of southerners living in the North had moved back to the South ahead of the referendum, not necessarily realizing that one must vote where they registered. Only around 60 percent of those who registered actually voted in the North, versus more than 99 percent in the South. "I am Sudanese, my origins are from the South, my parents are from the South-but I've lived here in Khartoum for most of my life," said Joyce Khamis, 29. "I didn't vote because I believe in unity. Whether there is secession or unity, we remain brothers and sisters." The referendum process implements a major pillar of the 2005 Comprehensive Peace Agreement and represents the realization of the aspirations of the people of Southern Sudan to determine their political future. In advance of the referendum, the Center deployed 16 long-term observers in September 2010 to report on referendum preparations, the campaign period, and political developments. 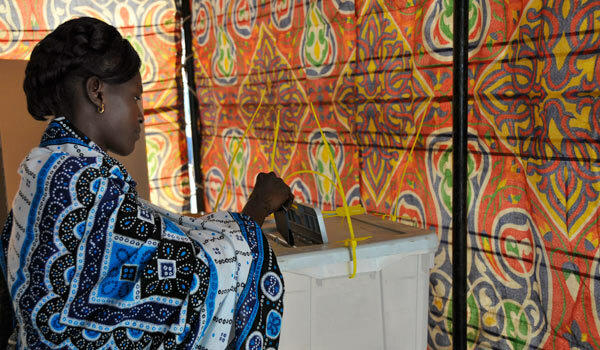 In November, an additional 56 observers were deployed in Sudan and overseas referendum centers to monitor the voter registration process, a critical exercise determining who could participate in the referendum. While the referendum itself was important, political decisions made by leaders in the coming few months will determine the future of this region. The North and South must resolve crucial issues such as border demarcation, citizenship questions, and the sharing of oil wealth before South Sudan officially becomes a country in July.